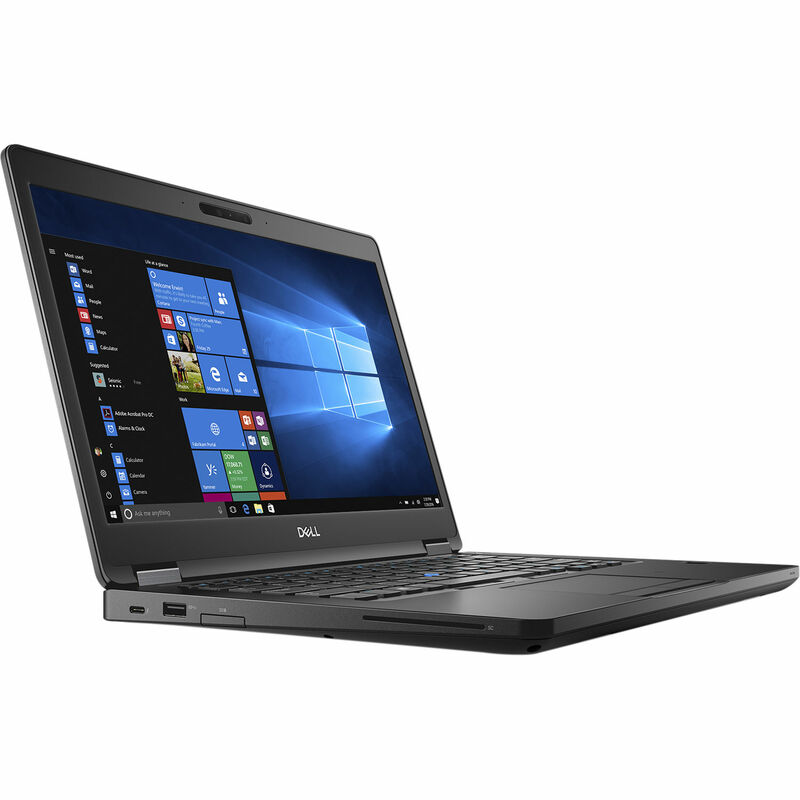 Designed for improved security, manageability, and reliability, with a versatile design and business features, the 14" Latitude 5490 Notebook from Dell is powered by a 1.7 GHz Intel Core i5-8350U Quad-Core processor and 8GB of 2400 MHz DDR4 RAM in a 1 x 8GB configuration, allowing you to run multiple programs simultaneously and quickly access frequently used files and programs. When running more demanding programs or tasks, the processor can be boosted to achieve a speed of 3.6 GHz using Intel's Turbo Boost 2.0 technology, and the memory can be upgraded to 32GB in a 2 x 16GB configuration. The 14" Anti-Glare display features a Full HD 16:9 resolution of 1920 x 1080 for playback of your media content, plus a brightness of 220 cd/m2, a refresh rate of 60 Hz, and viewing angles of 40/40/10/30°. Visuals are handled by the integrated Intel UHD Graphics 620 chipset, and you can output video to an external display using the HDMI 1.4 port, as well as DisplayPort via USB Type-C.
For storage of your files, this system comes with a 500GB 7200 rpm SATA 2.5" hard drive. If you want to add external storage, optical drives, mice, keyboards, printers, memory card readers, and more, the Latitude 5490 offers one USB 3.1 Gen 1 Type-C port and three USB 3.1 Gen 1 Type-A ports (one with PowerShare). Built-in stereo speakers, a microphone, and a 720p webcam let you participate in video calls for work or with friends and family. Connect to the internet via dual-band 802.11ac Wi-Fi or Gigabit Ethernet LAN for a more stable and reliable connection. Furthermore, to free up USB ports and reduce wire clutter, you can connect additional peripherals and devices using Bluetooth 4.2, while a built-in media card reader supports UHS-II SD formats. Dell's 14" Latitude 5490 Notebook operates using an included 65W AC adapter, a power cord, and a 4-cell / 68Wh ExpressCharge battery. The installed operating system is Windows 10 Pro (64-Bit). The Latitude's security, versatility, and accessories empower the way you work because your success relies on the ability to maintain office-level productivity, wherever your job takes you. Through Dell's vPro extensions, you can remotely manage a fleet of devices, including diagnostics, whether they are powered on or off. Leverage powerful performance with an 8th Generation 1.7 GHz Intel Core i5-8350U Quad-Core processor and a 500GB 7200 rpm SATA 2.5" hard drive to round out your Latitude 5490 and power your workday. With a Full HD display, you can work confidently. Your Latitude is also equipped with all-day battery life, or bring the separately sold Dell Power Companion for extended workdays. Tested against 17 MIL STD 810G benchmarks, Dell's durable system helps make sure your work stays safe. Navigate congested workspaces with ease with Gigabit Ethernet, 802.11ac Wi-Fi, and Bluetooth 4.2.